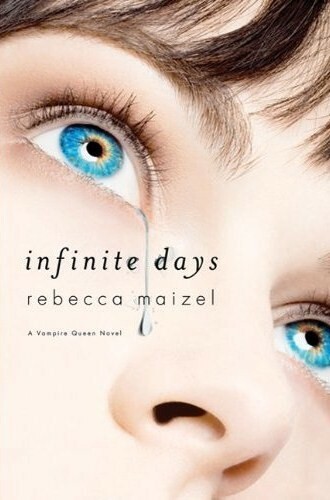 I had a lot of expectations for Infinite Days - I have heard many wonderful things about it and I was worried the book would not live up to them. It seems a lot of times, that when a book receives a lot of hype, it never is as good as you think it will be. While Infinite Days certainly had some flaws, overall, I truly enjoyed it. The book begins with a bang - you are introduced to Lenah, a sixteen year old girl (physically) who has just completed the transformation back to human. She has spent the last several hundred years as a vampire - and a ferocious, deadly one at that. She was basically vampire royalty; but she gave it all up in hopes of becoming a human. Also introduced at this point is Lenah's boyfriend/soul-mate/best friend - Rhodes. They share an intense bond - Rhodes is Lenah's maker, but they desperately love each other as well. Rhodes sacrifices himself to grant Lenah's wish for humanity and he only appears in Lenah's thoughts and flashbacks throughout the rest of the book. I LOVE Rhodes. From the first page, I was foolishly holding on to a hope that he did not actually die from the ritual. He is the epitome of the perfect boyfriend - I mean come on, he killed himself to ensure Lenah's happiness. Obviously, Lenah has a difficult time dealing with the loss of him and for the first time in hundreds of years, she has to feel grief. That's one of the marvelous things about this book. Maizel does a fantastic job sort of reinventing the vampire. In today's YA Literature we are constantly bombarded with vampire stories. More often then not, these vamps are portrayed as these tortured creatures who are just longing for human companionship. The vampire world in Infinite Days could not be any different. These are absolute monsters, who kill people on a whim. There are several flashbacks in the book in which Lenah recounts her life as a vampire - and she was an absolute feral woman. Maizel doesn't glorify the vampires - they certainly have relationships amongst each other, but they feel no compassion for mundane humans. This really gives an interesting quality and depth to Lenah. As a human, she is now rediscovering many human emotions and feelings others for the first time. She revels in touch - as a vampire she could not feel the texture of things; her nerve endings were all dead. She feels things with her whole body now and everything is exciting for her. Another fun little quirk is that she has to transition herself into the modern world. In preparation for the ritual, she hibernated underground for a little less than 100 years. This means she is completely unfamiliar with the ways of the modern world and all of its amenities. It gives her a sort of otherworldly quality and draws the attention of two boys in particular - Justin and Tony. Tony is Lenah's first friend at Wickham; the school where she is hiding from her former coven. Tony is instantly drawn to Lenah and they form an easy friendship. He is an artist and Lenah feels that he can see the real her; that he "gets" her. Of course, this wouldn't be a YA/Fantasy novel without a love triangle. Enter, Justin. Justin is the big man on campus and the object of every girls affection. He too is drawn to Lenah, even though he already has a girlfriend, Tracy. Lenah connects with him as well, and she is obviously more attracted to him than Tony. Honestly, I really didn't have a preference as to who Lenah ended up with. If I had to choose - I would say Tony, because Justin was a little flat to me - but I knew that she would pick him from the book description. I enjoyed both characters, but like I said before, I was still holding a torch for the dearly departed Rhodes. While I enjoyed all of the characters, there were a few plot points that sort of bothered me. First of all, I am not satisfied with the way the coven is led to Lenah. Rhodes loved Lenah more than anything. He sacrificed himself so that she could become human - and he went to great lengths to ensure her safety. He obviously planned out his course of action and covered all his bases. Are you seriously telling me that he would have missed that scrap of paper with the word Wickham on it? I think he would have made sure that ALL of the paper burned. I mean, with his super vampire vision, he would have easily seen it. I understand that the Coven had to find Lenah, for the story to continue, but the way it happened just did not seem right. The other plot point that seemed a little off was how quickly both Tony and Justin were taken with Lenah. I guess Tony's progression was more reasonable, he was good friends with her and they spent a lot of time together. But Justin hardly even knew her and was instantly obsessing over her. I know she is suppose to be an absolute knockout; but still these boys were falling in love rather quickly. But, that happens a lot in books, especially in YA novels. Despite those flaws, I still really enjoyed the book. I think that Maizel did a great job with the book and I cannot wait for the sequel, Stolen Nights. The book began and ended with a bang - it left me dying to know what happens next. Great review! I loved this one and I agree with everything you said. Justin did seem kind of flat to me, so I wasn't crazy about the romance. But the re-inventing of vampires was great! That was my favorite part. I'm excited for Stolen Night! I agree, too, about the romance-- it was pretty quick! I just loved this story. I was a little upset that she seemed to move to Justin so quickly after Rhode's sacrifice:( I got attached to Rhode instantly and I'm looking forward to this next book when I think things are going to get really interesting. I agree with you on the slip of paper with Wickham on it, that was a bit too easy, but I adored this one overall. Really enjoyed reading your review!